Yes we can fix it! If it's on your shoe, boot or sandal, we can fix it. Whether it's worth fixing, is really the question. Bring the pair in to us so we can help you decide whats best. Your repairs will be completed using systematic repair methods that not only allow us to confidently Guarantee your repairs but we also use menu board pricing, so you know what it costs before we do the repair. What keys do we cut? You can trust us to accurately cut all your standard "normal" looking House and Car keys. However if you have the latest Audi with a large plastic headed key ... take it to a reputable locksmith for a quote and also get a quote from your dealer. 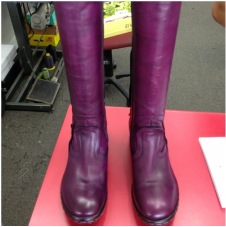 Looking for the largest colour range of polishes and paints specifically for footwear in Tauranga? Need replacement inner soles for casual, dress or performance footwear? Thin Leather Insoles. We also stock Fitting Aids, things like Heel Grips and Slip Stops that help get a loose shoe to behave. Laces, standard and leather. Dubbin, beeswax and Shoe Cleaners to. While Shane Barr Shoe Repairs does cut keys and supply Shoe Care, what we are really keen on is old fashioned proper Shoe Repairs, We don't do lock repairs, we don't do alarms, call outs or any fancy electronic car keys. We like to focus on what we do well so that you'll be stoked when you pick your shoes and boots up, on time as promised every time, guaranteed. We only do proper Shoe Repairs. Some people like quick dodgy jobs, where there is little thought or care given. We would prefer to do a great job that not only looks non-repaired but is also comfortable and lasts for the life of the shoe. We all spend a lot of our lives at our Shoe Repair store. We find it far more fun to spend our time with people that want what we have to give, “Proper Shoe Repairs’. We aim for your life and our lives to be that little bit happier because of your relationship with us. We want you to look forward to your shoes needing repair, so you can come and see us. If you’re happy coming to see us we will be happy to see you. We want you to be excited about the way your shoes look and how they feel when you walk. If you are happy because of your experience with us, you will invite your friends to see us. We will continue to grow and prosper, and we can feel proud that we have helped you achieve what you want. Your time is very important to you, and that makes it important to us. We usually run on time and we will call you if we are not on schedule to get your repair done when we have promised you. So you can safely assume your job will be done on time every time. There is no need to ring us. If you do decide to ring us please be prepared to speak to Mary the answer phone. Mary appreciates it when you speak slowly and clearly and put your name and number at the start and finish of your call. Please also leave enough information so that when we return your call we are prepared with answers to your queries. Other things you can do to help make your repair go smoothly. If your shoes are clean, we will assume you care about how they look and take maybe a little more time and put a little bit more effort into your repair. Always bring the pair of shoes, as we don’t want them to get lonely. No I joke, it just makes it easier for us. Sometimes with new customers we get a startled look when we ask for payment as the shoes are been dropped off. We do it this way for a number of reasons, the main one being, it speeds things up considerably when you come to pick up your shoes and people often all come in at once to collect their shoes. It also gives piece of mind for the customer as they now know the total cost of the repair, not just an estimate ... that might rise! What happens if we find something else that needs repairing? 7 ways we can help you make your favourite shoes look fantastic! Rebuild tips even when they are real bad!